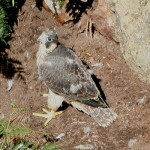 The National Trust for Jersey is delighted to announce that peregrine falcon chicks were ringed at a nest site for the first time in Jersey since the species became locally extinct in the late 1950s. The breeding site, on a stretch of Trust land on the north coast, has been monitored by a team of local ornithologists for the last few weeks. The chicks have been fitted with individually marked rings for future identification during an operation where other data were collected including biological measurements of the birds and prey remains in the nest. The peregrine falcon, a top predator of the skies once common on every continent except Antarctica, almost became extinct in the second half of the 20th century due to persecution and the use of pesticides that caused a fatal thinning of their eggs’ shell (see e.g. here). 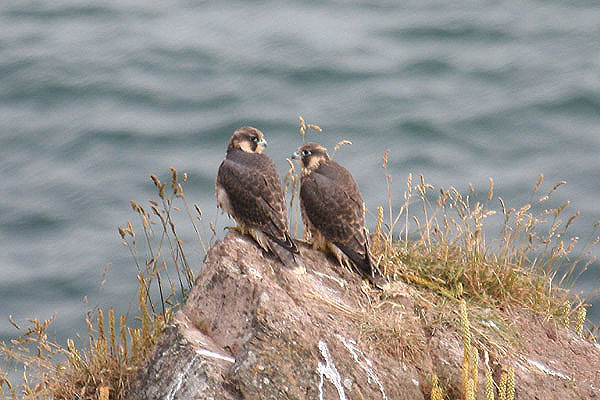 The disappearance of peregrines on the coastal cliffs of Jersey in 1958 was likely caused by the same reasons. Thankfully, bans of the pesticides such as DDT and legal protection awarded to the species have allowed it to recover worldwide and eventually make a comeback to Jersey, where a new breeding pair was found in the year 2000. 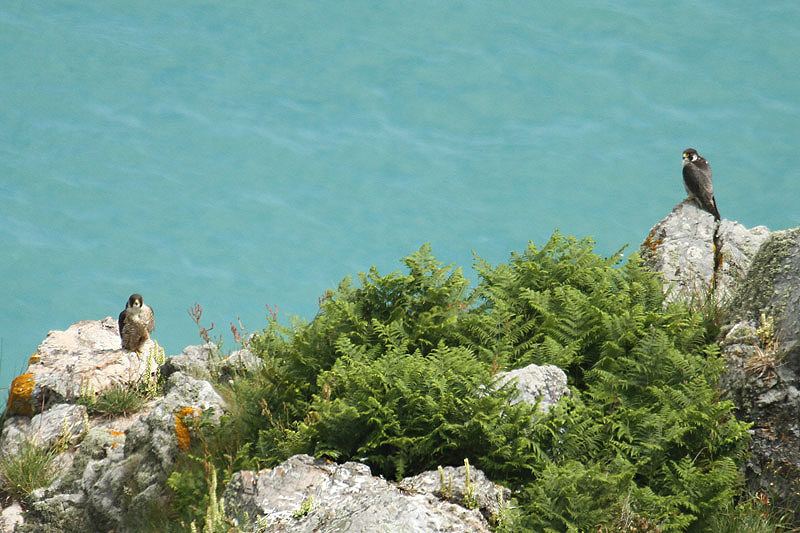 Since then, other pairs have settled on the cliffs of the north and south-west coasts and even in St Helier. 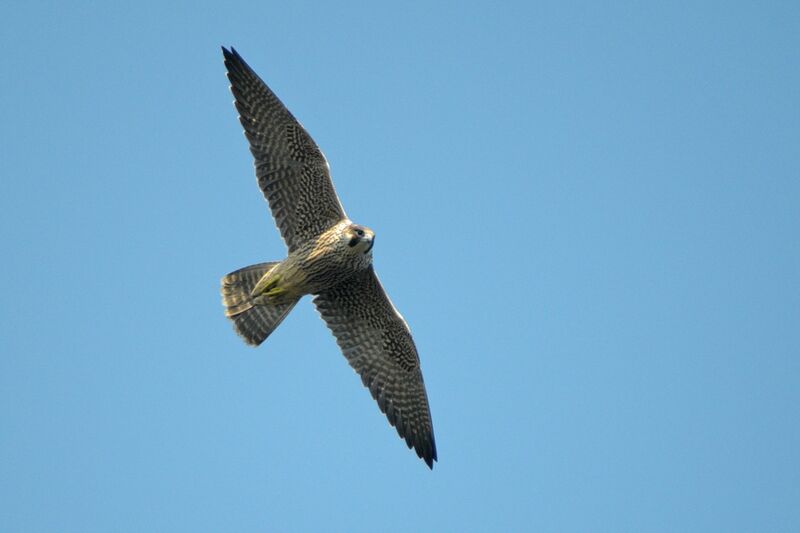 This year the Island population stands at seven pairs of falcons (there is a survey of peregrines in the UK, Isle of Man and the Channel Islands this year), of which five are found on the north coast (two of them on Trust land and two others at Sites of Special Interest). The peregrine has been given Amber status of conservation locally which reflects the small yet seemingly stable population (see full list here). So far this y ear only five out of the seven pairs have bred successfully, having raised 2-3 chicks each, which have already fledged. Up until now only fledglings that got themselves into trouble and had to be rescued had been fitted with the metal rings, this the first time since peregrines returned that a team of experts has been able to monitor a nest and ring the chicks. The information from bird-ringing projects like this helps scientists and conservationists to learn about issues such as migration, lifespan and breeding ecology (see e.g. Sussex Peregrine Study). It is hoped that in the future more chicks will be fitted with the same rings and help us further our knowledge of this species’ ecology in Jersey. 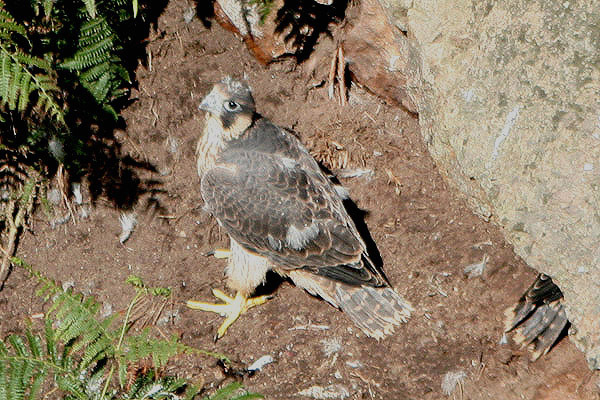 The presence of peregrines at a certain area indicates a dynamic food chain and a healthy natural community. 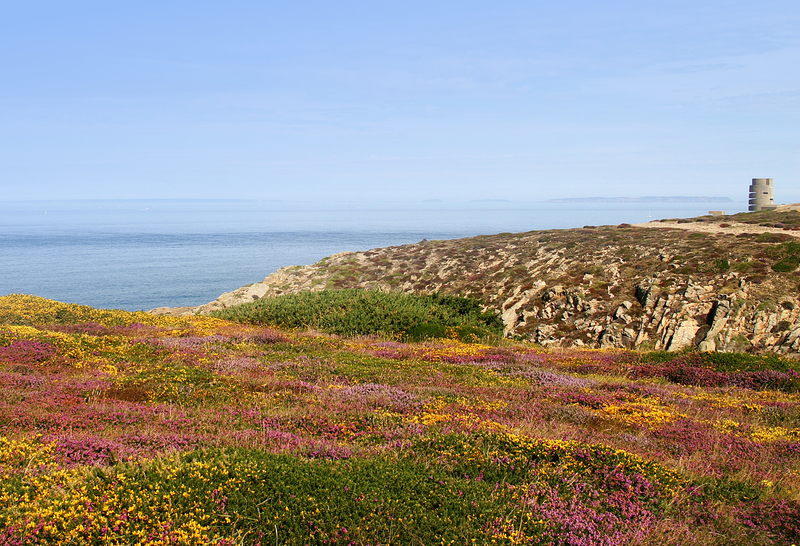 The National Trust undertakes active management on its land on the north coast and sees the success of this species as a sign of the recovery of the coastal habitats. 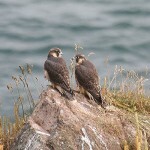 It is hoped that we will be able to enjoy the sight of a peregrine falcon cruising the cliffs for many generations to come.